Do people shrink with age? - Matthew D. Hepler, M.D. Losing or gaining weight with age is a known fact. You also know that your height is mainly determined by genetics, and in general it won’t increase after the age of 18-20. Is it then possible to lose height? Unfortunately, yes it is… because people shrink as they age! How does it happen? Our spine surgeon in Palm Beach County explains this interesting fact below. What’s the cause of height loss? As people get older, they get smaller, because of the nature of their spine. The spine supports your body like a pillar and hence, gives you height. However, there are a number of factors that can affect your spine and cause loss of height. Osteoporosis, also known as porous bone or degenerative joint disorder, is one of the reasons. This disorder weakens your bones and can lead to small, unexpected fractures in the back, which can cause curvature in your spine, thus cause height loss. In addition, over half of those micro fractures are painless and no other symptoms are present. It means people are not even aware of the problem. Women are more likely to get osteoporosis than men. How to determine if you have osteoporosis? The best way is to contact a spine specialist or make a consultation with our spine surgeon in Delray Beach who will, firstly, properly diagnose the problem and then customize an effective treatment. Another cause of getting shorter can be a medical condition called discs dehydration, which occurs over time. Your vertebral discs are filled with a gel-like fluid that keeps them flexible and strong. As you get older, the discs begin to dehydrate and this process causes a shrinking of the discs and of the space between spinal joints. In general, we start losing height at about 40 years of age, and we get about four-tenths of an inch shorter each decade. 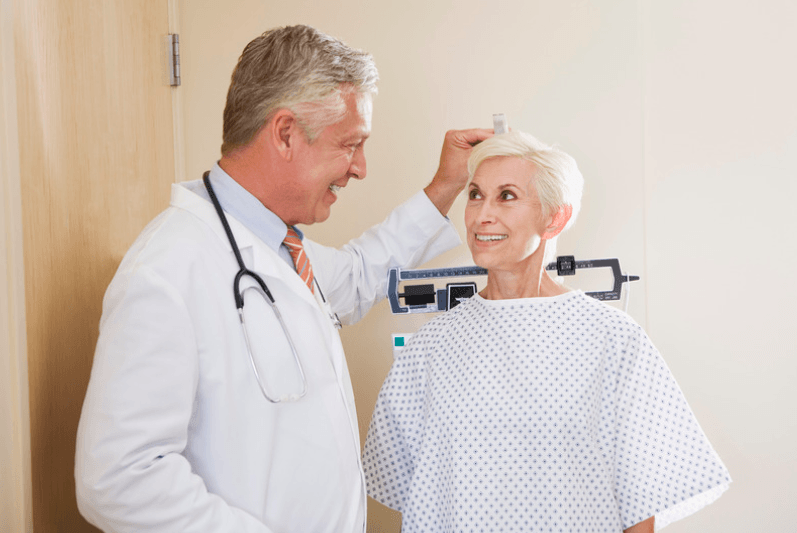 Women tend to experience height loss more than men, and by age 70 women lose two inches of height, when men on average lose approximately an inch and a half. Dr. Hepler is an adult and pediatric spine surgeon in Delray Beach and Fort Lauderdale. He treats all conditions of the cervical, thoracic and lumbar spine, and also provides spinal stenosis treatments. Additionally, he offers non-operative treatment options, such as pain medications, steroid injections, and physical therapy, as well as operative treatments, including both minimally invasive techniques and complex reconstructions. If you would like more information about our orthopedic spine surgeon, please Contact Us.